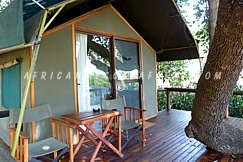 At Shinde Concession, you will enter one of the great, untamed regions of Okavango Delta. Experience the astonishing contrasts created when the mighty Okavango River flows into the arid Kalahari Desert - the result is a variety of habitats, riverine forest, palm islands, permanent swamps and dry sandveld all with an unparalleled wealth of animal diversity. The concession offers a diversity of ecosystem and activities, and your experiences of flora and fauna will vary depending on which camp you are staying at e.g. At Shinde, you are nestled on a lush palm island in the heart of the northern Okavango Delta at the edge of Shinde Lagoon, which teems with animal and birdlife during your land and water based game activity while at Camp Okavango and Xugana Island Lodge concentrate on water based activities only due to the location of the camp with a totally different flora and fauna experiences. 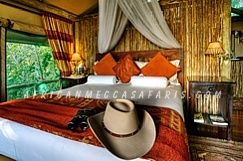 Footsteps Across The Delta is a comfortable private camp which accommodates guests in three specially designed, twin-bedded, Meru tents complete with sewn-in floors. Each tent has its own bucket shower and bush toilet, which is attached to the back of the tent and there is even a daily laundry service. Shinde Camp comprises eight twin-bedded classic safari tents, each with en-suite bathrooms, hot and cold running water and flush toilet. Every possible comfort has been catered for – from mosquito nets, electric ceiling fans, generated electricity and a private viewing deck through to a decanter of sherry! 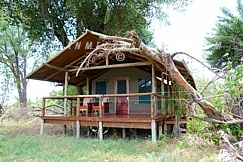 Shinde Enclave accommodates a maximum of six guests in three twin-bedded mosquito-proofed tents, each with en-suite bathroom, hot and cold running water and flush toilet (with a view). 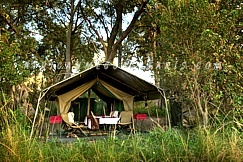 The luxury tents are within close proximity of the private dining area and viewing deck which affords a perfect hideaway location from which a family or small group of friends can explore the Okavango Delta. 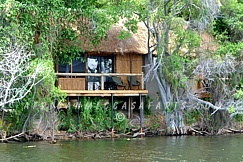 Xugana Island Lodge accommodates just sixteen guests in large raised reed and thatch lagoon facing chalets (eight of them), with en-suite facilities and private viewing decks situated on the shaded fringe of the island. An open boma and al fresco dining area overlooks the expanse of pristine water that makes up the permanent Delta in this section of the Okavango.